Di Mase Architects is committed to understanding our built environment as a necessary but problematic incursion into our natural environment. While accepting the very real need to house people, products and services, we actively seek to recognize the wide-reaching social and environmental consequences of urban growth and new development. Di Mase Architects encourages and promotes the adaptation and reinvigoration of existing structures and spaces as a way to limit the unsustainable expansion of our cities and minimise the need for new construction. Tens of thousands of buildings in inner Melbourne sit unloved and unused, but still our urban boundaries swell. Projects like this warehouse refurbishment in Collingwood allow us to showcase the potential value in adaptive reuse. 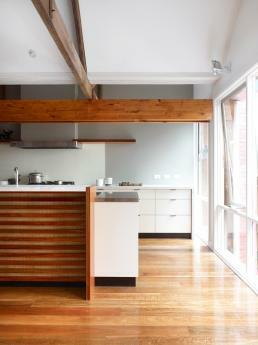 The approach here was to strip back layers of clutter built up over time to reveal the inherent beauty of the structure. The main spaces were retained and a restrained palette of materials and finishes was applied to create a comfortable and light-filled interior. The project is an opportunity to display the client’s collection of beautiful artwork; the main upstairs space becomes part gallery and part home. Projects such as this require a great deal of faith on the client’s behalf. At times the work can appear minimal and progress slow. Trust, communication and a shared passion for breathing new life into existing structures can lead to an outcome that is beautiful, sustainable and highly liveable.